What’s the best set of football cards… ever? 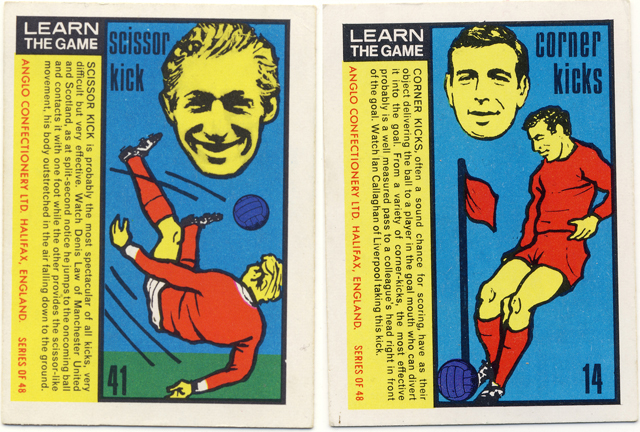 As anyone who’s got ‘Got, Not Got’ knows, it’s this Anglo World Cup / Learn The Game series from 1970. Why? Because of the ‘JFK Moment’-style memories they bring back, of training on the slopy driveway, following all these slightly insane skill tips to the letter. That scissor kick: ouch. Oh, hang on. Maybe that bit’s in ‘The Lost World of Football’. What’s that? You reckon you’ve got a different favourite all-time set, for entirely different but weirdly parallel nostalgic reasons? Go on, nominate away! Let the anecdotes roll about these hypnotic oblongs of sickly smelling cardboard. There’s got to be a GNG book in this at some point in the future, and you (and your tatty Topps Manny Andruszewski blueback from 1979) can loom large, if you like. Don’t worry, our wives and girlfriends will understand. This entry was posted in Uncategorized and tagged Anglo, football cards, Liverpool, manchester united. Bookmark the permalink. 3 Responses to What’s the best set of football cards… ever?